Jen Dickson is a Licensed Clinical Social Worker (LCSW) in Utah and valued member of the Syracuse Center for Couples & Families team. 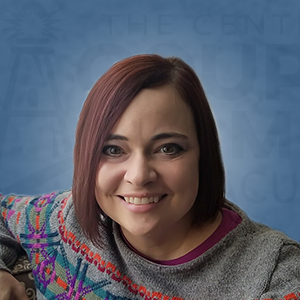 She has worked in the field of therapeutic services since 2003 with an emphasis in working with children, teens, and their families in acute inpatient, residential treatment, school, and outpatient settings. She specializes in treating trauma and attachment. You can expect various interventions such as EMDR (Eye Movement Desensitization and Reprocessing), Individual & Family Therapy, and Attachment Focused Therapy to address your needs. Jen prizes working closely & collaboratively with her clients to find what helps them the most. Her therapeutic services are strengths focused and client-driven. When Jen is not serving her clients, she enjoys camping with her family and reading. Sometimes she does both at once!